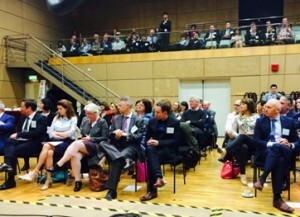 RTÉ recently hosted over 100 senior business and arts representatives at their Radio Centre to hear about how corporate and cultural partnerships can breathe new life into communities. Using the Bid process for the European Capital of Culture 2020 as a starting point, Minister Heather Humphreys TD described the work cities would undertake to prepare their Bid, and called on the business leaders present to engage in the process. The Minister also called on the corporate community to become involved in both the Commemorations Programme during 2016 and the work the Department of Arts, Heritage & the Gaeltacht is undertaking to prepare Culture 2025, a Cultural Policy for Ireland. Our Moderator for the event, Sean Rocks welcomed representatives from the four City Bids – Dublin, Galway, Limerick and the South East (Kilkenny, Waterford and Wexford). But going first to a panel of speakers, the context was set in a discussion about creative partnerships between culture and corporates, and the benefits for the community in the run up to and after 2020. NCAD Director, Professor Declan McGonagle, who has been involved in several City and Capital of Culture projects, spoke of the success of Liverpool Capital of Culture 2008. It helped tell a new story for the city and brought new engagement levels for organizations across the region. There was a four year run up to allow for long term planning focusing on legacy and momentum. Declan emphasised the importance of establishing working definitions of culture that are transformative and carry through to wider society rather than stay trapped within the cultural sector. Whatever city bid wins, “the outcome of the year should be raised expectations” for Ireland. Eamonn O’Reilly, Chief Executive of Dublin Port Company, spoke of the historic and positive connections between a city, its citizens and its port. Highlighting a contemporary disconnect in those connections, culture has taken a place within Dublin Port’s ‘soft values’. “In the last 5 years, art has helped us form the language, the ability to get key messages across about the Port”, citing examples such as Cliodna Harmey’s Dublin Ships project on the bridge at the CCD. As a tool for local engagement related to industrial heritage, Eamonn said the Arts allow Dublin Port the ability to relate to people in more than just economic or statistical terms. The Chief Executive of Business to Arts, Andrew Hetherington, talked about creative placemaking in rebuilding communities. How stakeholders from the private and public sectors, funders, not for profit, and the community think strategically and have an understanding of the importance of culture at the core of their activities. “Following a significant human investment, this is an opportunity to gather different communities and make them think where we want a city, a nation, to be after 2020.” The bid process presents an opportunity to gather different communities and talk about where we want to be in 2020. Each of the four candidate cities/regions for the 2020 European City of Culture, briefly spoke about their region’s starting point for the Bid. First up, Michael Quinn of the South East Bid team (composing Waterford, Wexford and Kilkenny), spoke of the compelling logic for a region to come together, providing greater diversity for a high quality programme, than just one city. Ray Yeates of the Dublin Bid urged the audience not to underestimate the economic value of fun, and its potential to show all citizens that their lives matter. Limerick’s Sheila Deegan talked of the success of Limerick’s designation as City of Culture in 2014 in revitalizing the city and its vibrant cultural communities. It foresees culture continuing to refocus their perception of themselves for 2020. Patricia Philbin talked of Galway’s Bid as being like an engine for the West. They have been bringing people together to create a vision for the Region and in particular young people have proposed some excellent projects, which may feed into to a city development plan. Regardless of the outcome of the Bid process later this year, each city commit to work together to ensure long term legacy for Ireland from the European Capital of Culture in 2020. Our thanks to everyone at RTÉ particularly Moya Doherty, Chair of the RTÉ Board (and former Board Member, Business to Arts) and Lorelei Harris, Head of Arts & Cultural Strategy, for hosting this engaging discussion. On 16 April 2015, Business to Arts and the DeVos Institute of Arts Management at the University of Maryland, will begin a new 18-month arts management training and consultancy programme for 10 organisations. This will build on the success of the two-year partnership for 23 organisations which finished last Summer, as part of the New Stream Programme, supported by Bank of America Merrill Lynch, The Department of Arts, Heritage & the Gaeltacht, The Ireland Funds, and Business to Arts’ wider business membership. This intensive programme will focus on strategy development, implementation, and capacity building in an organisational context. It will combine group seminars with regular ongoing, one-on-one consultations with each participating organisation. Sessions will be led by Michael M. Kaiser, Chairman of the DeVos Institute and Brett Egan, Director of the DeVos Institute, supported by Business to Arts. Throughout the 18 months, participants will work on revenue diversification, individual giving campaigns, board development, marketing and strategic planning. From 2012 to 2014, the DeVos Institute led a two-year teaching and consulting programme to support 23 Irish organisations in artistic planning, fundraising, marketing, strategic planning, financial planning, and board development. The cohort’s progress extended across each of the core areas. An organisation’s health—indeed, its survival—relies on the quality, imagination, and distinctiveness of its programming. If it fails to produce superior programmes, educational opportunities, and productions with enough time to market them effectively, the organisation cannot say that it is successful or that it deserves support. It is likely that, before long, its donors and ticket-buyers will come to agree. The impact of strategic planning and a longer planning time frame has contributed to a significant number of organisations improving their productivity through marketing efforts, an increase in total earned revenue, earned income, and an expansion of their audience base. Organisations advanced towards donor diversification by increasing the number of funding sources and decreasing their dependence on top funders. Organisations reporting an “actively engaged board” increased by 40 percent, while a decrease in the same number was reported for a “sporadically active” board. The majority of organisations (83 percent) began, revised or completed a Strategic Plan during the two-year programme. The DeVos Institute of Arts Management provides training, consultation, and implementation support for arts managers and their boards. It operates on the premise that while much is spent to train artists, too little is spent to support the managers and boards who keep those artists at work. At the same time, rapid changes in technology, demographics, government policy, and the economy have complicated the job of the manager and voluntary board. These changes continue to accelerate. Organisations that have mastered these trends are flourishing—even leveraging them to their advantage. For those which have not, however, the sense that “something’s not quite right” can seem unshakable. For too many, these changes have led to less art, decreased visibility, diminished relevance—even financial collapse.